Cryptocurrencies are all over the news right now – and the more coverage they get, the more people are tempted to check out their investment potential. But as with any community that’s sprung up from the internet, the cryptocurrency world is full of slang and memes that can be both bewildering and off-putting to outsiders. So, if you’re new to the world of cryptocurrency, here’s an illustrated glossary to some of the most common terms you’ll need to understand if you’ve got any hope of being a whale instead of a bag holder. Those who own more than 5% of any cryptocurrency coin are considered whales – and potentially dangerous ones, at that. The crypto world is full of mystery and intrigue, and whales often take the blame when currency prices go south. They might be well-established investors or just incredibly rich. But one thing is for certain: the whales have enormous influence in the cryptocurrency market. Some of the most popular internet memes are acronyms or phrases borne out somebody’s mistake or typo. HODL manages to be both at the same time. The story goes that in 2013 on a Bitcoin forum, someone tried to advise someone else to HOLD – that is, not panic and sell your coins – but instead wrote HODL. Coincidentally, it turned out to be an acronym for ‘hold on for dear life,’ and a legend was born. When the going gets tough, the tough HODL. But HODL-ing isn’t always the right move when it comes to investing, and that includes cryptocurrencies. When the going gets so tough that the value of your investment is plummeting, you must know when to let go. Those who wait too long will be forever derided by cryptocurrency experts as bag holders – the ones left holding the (empty) bag. ‘Holding’ is even spelled correctly in this one, such is the gravity of the situation. There’s nothing quite so tiresome for established cryptocurrency stalwarts as FUD – otherwise known as fear, uncertainty and doubt not grounded in reality – being spread through the media. Though ‘noobs’ (newbies) might be scared into selling their positions, seasoned investors are often keen to use FUD-induced price drops as a buying opportunity. The worlds of cryptocurrency and gaming are inextricably linked, due in part to them both being online communities with unique language and social rules. So it’s no surprise that a fair amount of cryptocurrency slang comes from the gaming world – including #rekt, the hashtag that describes when investors get blown out of the water by a catastrophic coin collapse. If you’re left holding the bag for too long, you’re going to get #rekt. Cryptocurrency slang is far too modern for this to be a The Honeymooners reference, so what does ‘to the moon!’ mean? Basically, it means that a cryptocurrency is going all the way up – to the moon, metaphorically speaking. There’s a lot of necessary bravado around Bitcoin, and this is investors’ rallying cry. Back in 2014, the Slovenian Bitstamp exchange saw the only (to date) emergence of the dreaded BearWhale in the wild. 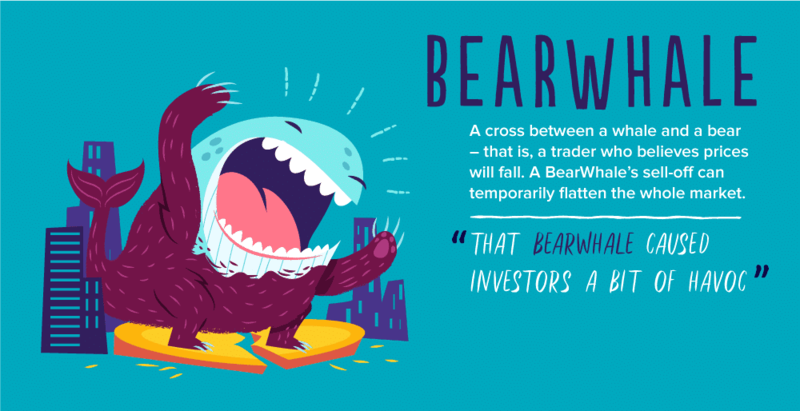 A BearWhale is a trader who acts like a bear – that is, believes prices will fall – and also happens to be a whale (see above). When this one tried to unload 30,000 bitcoins, the market went into crisis mode. It took the combined efforts of hodl-ers and whales to get things back on track and ‘slay’ the BearWhale. That sentence wouldn’t have made any sense before this glossary, would it? Vaporware is the fancy name for coins that you really don’t want in your wallet. These coins are surrounded by hype and artificially inflated in value. In reality, though, they may be worth next to nothing – also known as, well, a type of coin that rhymes with ‘Bitcoin.’ Don’t be left holding this bag, unless you want to be #rekt. In the ‘real’ world, a shill is someone who works with a con artist to help scam people into buying snake oil by pretending to be a satisfied customer. In the cryptocurrency world, a shill promotes a coin for their own gain – not out of the kindness of their hearts. Be wary of taking the advice of a suspected shill, or you might end up with a handful of vaporware. Being immersed in the world of cryptocurrency can be intimidating for newcomers. But armed with this glossary, you’ll be ready to make sense of the phrases that you’ll no doubt come across in forums and on social media. So when someone tells you to HODL, you won’t end up sounding like a total noob.